If you’re familiar with Adana Twins, the German duo who exploded onto the deep house scene in 2012, you’re already aware of the quality of their production. Friso and Take It Easy have gained international acclaim as the Adana Twins with their club hits “Strange” and “Everyday”, the two have cultivated a style that is fun, refined and distinctly their own. 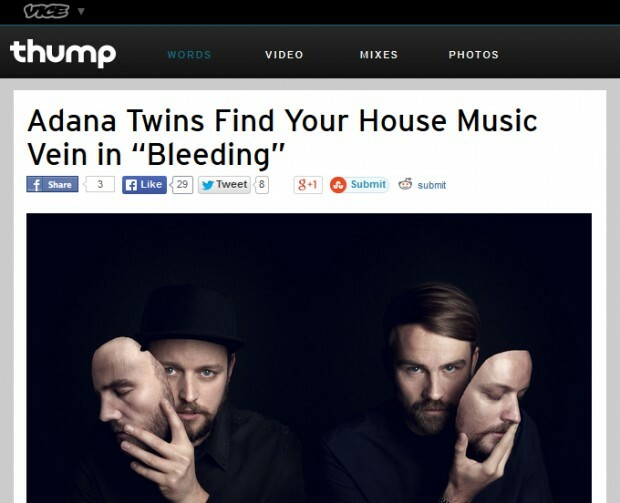 The pair’s latest offering, “Bleeding (feat. Human Life)”, is no different. Sleek beats and clever vocal snippets from LA-based act Human Life are supplemented by an intricate synth line. A driving beat builds intensely towards the middle of the song before gradually easing up towards the end. The structure style is unexpected, making this track a heavy hitter for a packed, sweaty dance floor. Listen to “Bleeding” above, and grab the single on February 23 on Exploited.